The SecurePay eSec payment method is now deprecated and has been replaced by SecurePay's Direct Post browser redirect payment system. As a result, you should use the SecurePay Direct Post Payment Gateway when integrating Matrix with SecurePay. The SecurePay eSec Payment Gateway asset allows you to create an eSec payment gateway, providing users with a secure way to pay for their items. In order to use the SecurePay eSec Payment Gateway, you will need a merchant account at the eSec payments Gateway website. For more information, visit the SecurePay website. The eSec payment gateway allows both VISA and MasterCard transactions. Once you have added a SecurePay eSec Payment Gateway, you can configure its settings on its associated asset screens. The majority of these screens are the same or similar to those for a Standard Page and are described in the Asset Screens manual. In this chapter, we will describe the Details and Display Formatting screens, which are different for a SecurePay eSec Payment Gateway. When you create a SecurePay eSec Payment Gateway, the Display Format Bodycopy asset is automatically created beneath it, as shown in the figure to the right.You can use this Bodycopy to define the contents and layout of the SecurePay eSec Payment Gateway form. This Bodycopy can also be accessed via the Display Formatting screen. The Details screen allows you to configure the settings of the SecurePay eSec Payment Gateway. For more information about the Status, Future Status, Thumbnail and Details sections, refer to the Details Screen chapter in the Asset Screens manual. This section allows you to enter your merchant ID, allowing you to accept payments from the payment gateway. In the Merchant ID field, enter your merchant ID, supplied to you by your bank. In order to accept VISA and MasterCard payments from the eSec Payment Gateway, you will need to obtain an Internet Merchant Account Facility from your bank and complete the Merchant Application at the eSec Payments Gateway website. For more information, visit the SecurePay website. In the Test Mode field, select whether or not to use the payment gateway for testing purposes only. If this field is set to On, the payment gateway will not process any payments and the Number field on the SecurePay eSec Payment Gateway form will be replaced with the test drop down menu, as shown in the figure below. The Display Format Bodycopy is used to define the layout of the SecurePay eSec Payment Gateway page. The default layout of the payment gateway is shown in the figure below. 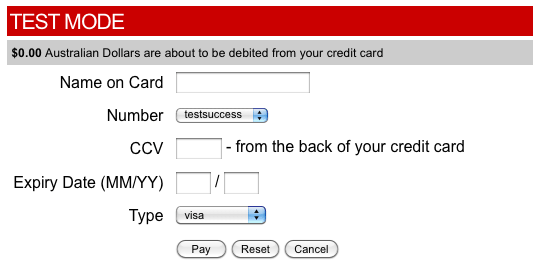 Credit Card Number: this will show the credit card number field. Credit Card Expiry Year: this will show the credit card expiry year field. Credit Card Expiry Month: this will show the credit card expiry month field. Credit Card CCV field: this will show the credit card CCV field. 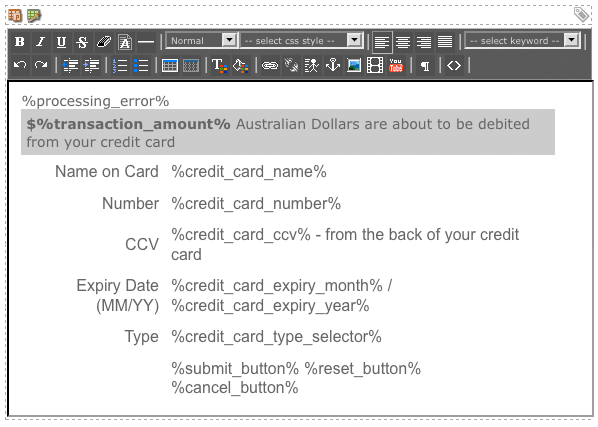 Credit Card Type Selector: this will show the credit card selector field. VISA and MasterCard are the options available in this field. Tip: The majority of these fields are compulsory when creating a working payment gateway. The Cancel Button, Reset Button, Transaction Amount and Processing Errors fields are not mandatory but are highly recommended.